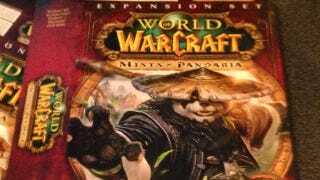 Here's a Look at Mists of Pandaria's Box Art—Is a Release Date Coming Soon Too? Redditor JimmijTheRustler just up and published that image of what appears to be the official box for the upcoming Mists of Pandaria expansion to World of Warcraft. It looks legit—that UPC barcode checks out. Yes, that was submitted very early this morning—however, on the World of Warcraft forums, a reader has pointed out that the number sequence follows the one Blizzard has used ever since it released the Battle Chest. And yes, this has been rated T by the ESRB, so that part's legit, too. The tipster who put this on Reddit suggests that the "Mists of Pandaria dissipate this Summer," but whether that means a release or just a general revelation of the expansion's details—including its release, who knows. The expansion did enter a closed beta in March. Full width version is below the attribution. (Click it to enlarge).